The investment world's love affair with all things ETF did not wane in 2010, as their share of the market rose to $940 billion in assets, held in more than 1,000 exchange-traded funds. There was plenty of excitement: Nearly 200 new distinct portfolio ETFs were introduced through Nov. 30, according to preliminary data from Morningstar (MORN). "ETF providers seemed ready to adapt Apple's (AAPL) marketing slogan, 'We have an app for that' and say 'We have an ETF for that,' " says Cameron Short, a certified investment management analyst with Stifel Nicolaus. Then there was the flash crash drama. On May 6, about 20% of ETFs were temporarily snarled in the trading glitches that took place that day. At some point, about 210 of the then 980 ETFs changed hands at prices more than 50% below their ultimate closing price, according to Morningstar. 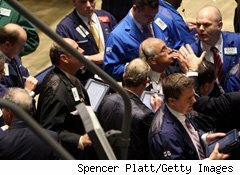 As for which funds have been hottest so far in 2010, preliminary data from Morningstar, Jan. 1 through Nov. 30, reveal winning categories: US ETF Commodities Precious Metals, up 118.38%; US ETF Equity Precious Metals, up 42.42%, US ETF Real Estate, up 23.75%; US ETF Small Growth, up 23.47% and US ETF Consumer Discretionary, up 23.46%. As for the laggards: US ETF Bear Market was down 29.55%; US ETF Commodities Energy, down 14.78%, US ETF Commodities Industrial Metals, down 5.42%; US ETF Europe Stock, down 3.81%, and US ETF Utilities down 1.12%. There were a few lessons too. "Not all ETFs are the same," says John Bracket, a partner with BAR Financial. "Some of our MVP ETFs folded in 2010 because they did not have the asset base that would make them viable going forward. Some passive ETFs that we thought would be index trackers did not perform that way. We ran into illiquid ETFs that stunted our ability to get money out when we wanted it." This year was all about commodities. "ETFs have become the vehicle of choice for exposure to the commodities market," says Short. But what concerns him is whether investors really get how a particular ETF, selected for exposure to a particular commodity, invests their money. ETFs gain exposure to a commodity by either investing directly in the futures market, or investing in publicly traded companies associated with a particular commodity. "Commodity ETFs rarely correlate exactly with the underlying commodity," Short explains. "Investors need to determine if by purchasing ETFs they are acting as a trader (for the short term) or an investor (for the long-term)," he adds. Longer-term investors may not want to hold an ETF that invests directly in the futures market because the cost of rolling those futures contracts monthly and the possibility of contagion in future contract prices could hurt long term performance, he adds. "ETFs that invest directly into the futures market are better suited for shorter-term investors who won't have to worry about the costs of rolling future contracts," says Short. Paul Brahim, executive vice president and managing director of BPU Investment Management, sites a couple of worrisome trends from 2010. "We are seeing growth in the number of ETFs being offered in three areas, and in each case, many investors are using ETFs in a way that can be dangerous to the health of their portfolio." He points fingers at leveraged ETFs, which multiply the risks and rewards of the bets they make by investing on margin. Typically, a leveraged ETF will have as its goal shorting a universe of stocks, such as the S&P 500, and by leveraging, double their bet. "These ETFs were designed for day-trading, but many small investors are buying them and holding them as a hedge, which is a mistake because when the bet goes wrong, the losses mount up quickly," says Brahim. Leveraged ETFs have caused some investors headaches by not delivering the expected result of double or triple performance versus their benchmark, adds Todd Millay, managing director of Choate Investment Advisors. Second on Brahim's list are the suddenly popular target-date ETFs, which he says many people have started using in their self-directed 401(k)s, thinking that they are a "no-muss, no-fuss way of investing their money." Not so. "Target-date ETFs have all the disadvantages of target-date mutual funds, including the possibility of inappropriate allocation and the lack of control that the investor has over what's in the fund. Investors who use any target-date fund should remember that there should be no such thing as autopilot when it comes to an investment portfolio," he adds. Next, he says narrow, narrow and more narrow is a trend is being misused by investors. "Financial companies continue to cut industry sectors into ever more narrow ETF slivers -- for example, ETFs that invest in water or corn, instead of ones that buy a basket of commodity companies. These ETFs are great for placing a bet on a narrow industry like solar energy or nanotechnology, but too many people buy a lot of 'slivered' ETFs and think they have achieved diversification, when in fact they have just placed a bunch of narrow bets," says Brahim. While the proliferation of new launches ultimately should only benefit consumers, says W. Ross Singletary II, managing partner of Arcus Capital Partners, this trend does have the potential to create confusion. Eric Dunavant, president of Dunavant Wealth Group urges investors to be cautious about the type of ETFs they use. "Stick to traditional indexes like the S&P 500, Russell 2000, and MSCI EAFE," he advises. "If you want to diversify with other assets, stick to mutual funds with a longer track record of investing in those areas, especially commodities. These new ETFs may look fun and exciting, but if they are new, no one has any experience with what they will do. I wouldn't buy a mutual fund with less than 3 to 5 years of management experience, and I think the same goes for ETFs," he adds. Then too, not only is the overcrowded market confusing, it at times can be dangerous because it can lead to low liquidity on certain ETFs, adds Dunavant. Low volume often leads to wide spreads between bid prices and ask prices. That can mean that two investors purchasing the same low-volume ETF at roughly the same time, could pay dramatically different prices, points out Don Moulton, director of financial services at Retirement & Tax Planning Specialists. Worse, he says, when trying to sell the ETF, investors might find few buyers, and those buyers might only offer prices far below what most would consider fair market value, especially if you're selling during a market panic. "The explosion in the last year has opened up the world of ETFs that can be as dangerous to investors as a loaded gun, especially to someone who has no idea how to handle one," says Dunavant. "Yet the marketplace wants to sell them as an easy way to invest. This overcrowding can also be confusing to financial advisers, many who don't have the time to research the nuances of all the new ETFs." The first rule of investing, reminds Moulton, "is know what you're investing in. Just because an investment product says it tracks the price of a given commodity, it's very important to understand how it tracks that commodity's price." As for 2011, the crystal ball gazers predict that ETFs will continue to take market share from traditional mutual funds. "They are cheaper, more liquid, allow access to strategies not possible through mutual funds, and within the equity and fixed income space, ETFs often have superior investment returns as compared to similar mutual funds," says David Roda, CEO of Roda Asset Management. ETF specialization will go further, carving out even smaller nooks and crannies in the investment world. ETFs are still one of the fastest growing investment vehicles, and right now, experts don't expect anything will slow them down.